Stocks with high volume get all the attention. Volume means participation. It means action. It is no wonder that traders like high-volume stocks and neglect the low-volume ones. But this approach misses the potential of low-volume stocks to find explosive moves. While the market is always right, its participants are mostly wrong. Most traders enter as a trend ends, explaining why trends end with climatic volume. On the other hand, few traders manage to get in before a trend starts. Thus, low volume may hint at the beginning of a trend. To find low-volume days, I look for days with the lowest volume in the past 233 trading days. For those familiar with the NR7 pattern, this is like the NV233 pattern. Instead of the narrowest bar range in the past 7 bars, I look for the lowest volume in the past 233 days. In the charts below, the NV233 trading days have a yellow background. This chart shows the daily prices of Regions Financial Corporation (RF). The two low-volume days showed a sustained lack of interest in RF. Soon after, it shot upwards with increasing volume. This is a recent low-volume day. It preceded a price plunge with great timing. 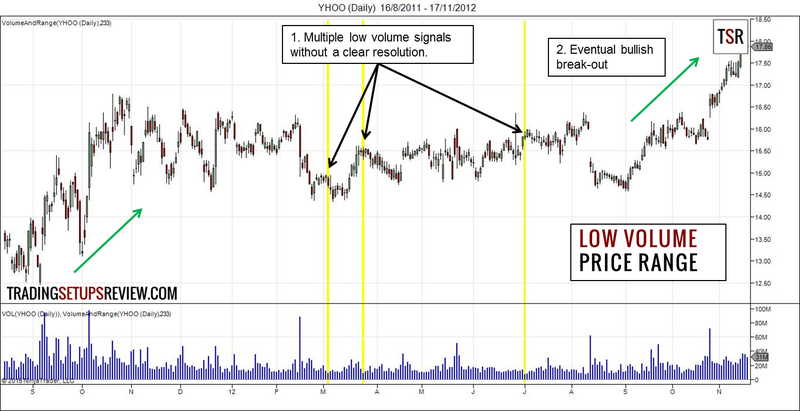 This chart shows the daily prices of Yahoo! Inc (YHOO) starting with a healthy bull trend. However, the low-volume day at the high of the bull trend was not expected. It was clear that the market’s interest in the bull trend was dwindling. Prices started falling a week later. Low-volume trading days are not always great for market timing. This example, also from YHOO, is messier. Multiple low-volume days hinted at explosive moves. Yet, the market whipsawed within a price range, foiling any directional trade. Eventually, the market broke out into a bullish trend. 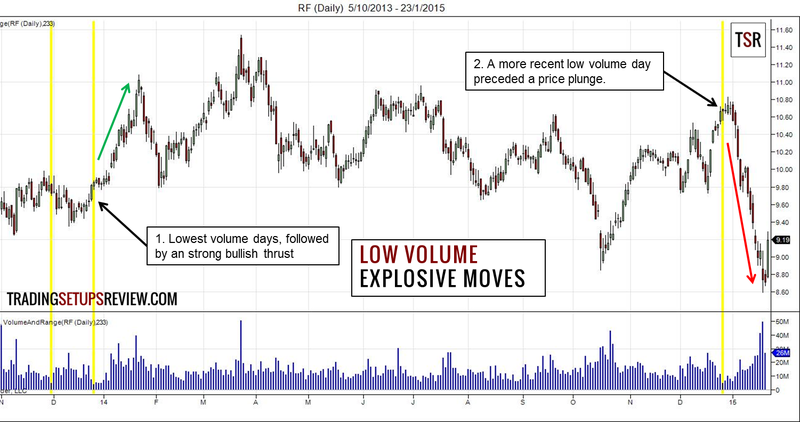 Although low-volume days precede explosive moves, the low volume/volatility can last for an indefinite period. Hence, it is tough to take advantage of it. As you can see from the examples, low-volume days are not the perfect timing tool. Like all other trading signals, they work within the right context, at times. 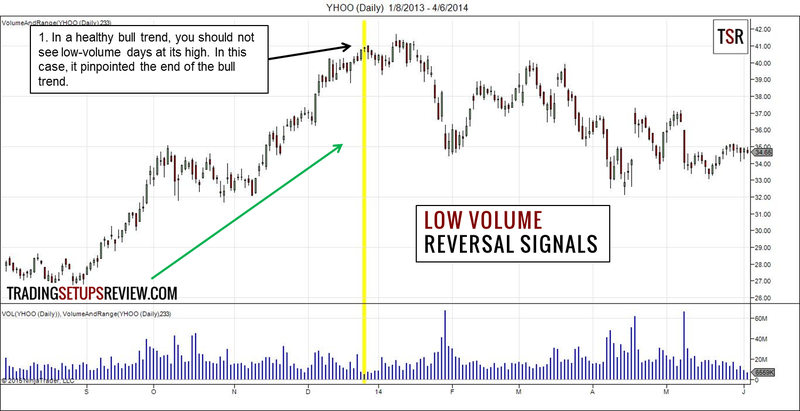 When you expect low-volume signals to work, use these ways to profit from them. Low volume tends to coincide with low price volatility. Hence, a break-out trade setup like the Bollinger Squeeze is ideal. Position yourself with stop orders to enter as the market volatility picks up. It is often challenging to guess the break-out direction. What we are more certain of is an increase in volatility. In such cases, the straddle trading strategy is useful. A call option is profitable if the break-out is bullish. A put option is profitable when the market breaks downwards. A straddle includes buying both calls and puts with limited risk. Hence, it is positioned to profit from a break-out in any direction. In this sense, it is a direction-neutral strategy. However, if the break-out is not significant, a straddle strategy suffers on both fronts. Learn more about the straddle strategy here. Many fundamental traders combine their analysis with technical triggers. If you already have a directional bias for a stock, use a low-volume day as your trigger. A low-volume day can get you in before other traders. As the market pans out according to your analysis, you stand to gain from the early entry. The main lesson is to pay attention to the quiet guys. When a stock shows exceptionally low volume, it means something. If you can decipher what it means, it becomes a unique weapon in your trading toolbox.